Connecticut State Troopers urge drivers, parents and children to prepare for back to school safety. As over half-a-million Connecticut children head back to school over the next few weeks, Connecticut State Troopers urge all parents and guardians to discuss school, traffic, and personal safety with their children. Troopers also caution all drivers to be aware of “back to school” bus, pedestrian, and bicycle traffic. Drivers are urged to use extra caution as they travel on Connecticut’s roadways, and to be alert to children who may be hurrying to and from school. 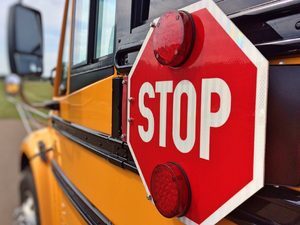 Under state law, it is mandatory that drivers stop for school buses that have their flashing red warning lights activated, whether they are approaching or following the school bus. The yellow flashing lights are a warning to drivers that the bus will be stopping to pick up and/or drop-off students. Drivers should anticipate that the red flashing lights will come on shortly after seeing the yellow flashing lights as the bus comes to a stop. The red flashing lights on a school bus indicate that the bus is stopped and students are either getting on or off the bus. Failure to obey this law not only puts our children at great risk, but it carries a hefty penalty for drivers. Fines for passing a school bus that has its flashing red warning lights activated starts at $465 for a first offense. Parents should also remind their children to wait for their bus in a safe place, out of the travel portion of the roadway, and only cross the street after looking both ways, even if the red lights are activated. Urge children to tell an adult and the police about anything that makes them feel unsafe or uncomfortable on the way to/from school and while they’re in school. Children should be reminded not to speak to, or get into the vehicles of people they don’t know. All Resident State Troopers and Troopers on patrol will periodically monitor school bus stops to help ensure the safety of all students as they travel back to school to begin the 2017-2018 school year.